Alcohol was both a God Send and Devil's Torment on board naval and pirate vessels. Thanks to Captain Billy Bones in the book, Treasure Island, the alcoholic beverage most associated with pirates is rum. Of course, rum has a long association with the British and American navies because both navies had liquor rations and that liquor was usually rum. Rum is a distilled alcoholic beverage made from fermented molasses. At one time it was all the rage in the American colonies as well as Caribbean because of its inexpensive means of production. Rum was no the only alcohol on board a ship; beer and wine were also very common. Why was alcohol on board ships? Sailors needed to drink and water was difficult to keep fresh. Alcohol was used to extend the life of the water. Often, the first liquids to be consumed on the ship were beer. Beer would go bad just about as fast as water but it had some flavor to it and the alcohol helped the crews morale. Once the beer was finished or had gone foul, then the crew would turn to water. 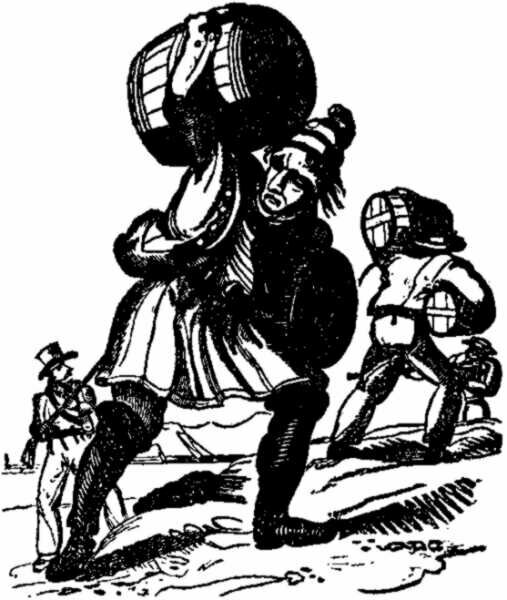 Water was stored in wood barrels and tended to go bad, especially on long voyages. However, the water could be made drinkable (bad beer was just bad beer) A dram (a small amount) of alcohol, normally rum, was often added to the water to kill the algae and make it taste better. Many navies also had an alcohol ration which was strictly controlled by the quartermaster. This ration was usually about 4 ounces of rum a day. The purpose of the rum was to improve morale. In an effort to prevent hoarding of the sailor's ration, the rum was often added to water making it more difficult to store large quantities. This mix of rum and water called grog. There are many stories of why grog is called grog. The two most common involve Admiral Lord Edward Vernon (1684–1757) of the British Navy. One story claims the drink refers to his "Grogham" coat and that he came up with the idea of mixing the rum and water. Another story claims he was the old grog -- an alcoholic. Vernon probably did create the policy of mixing water with the sailors rum ration but the word grog dates from an earlier time. Whereas the common sailors drank rum and ale, the officers tended to drink wine. The most common wine in the British Navy, being port. Port wine which was first produced in 17th century in the Duoro Valley in Portugal. Port wine is a red wine that has been fortified with addition of grape brandy during the fermentation process, making it very stable and capable of enduring long sea voyages. Coffee and tea were also added to the ship's water in order to make the water drinkable. Today we know that boiling the water killed the germs but this was not always possible or practical aboard a ship. Rum would often be the downfall of many pirate crews. Unlike military and merchant ships where some kind of authority measured out the rum being consumed, a democratically run pirate ship, with its weakened code of discipline, sometimes led to a complete disregard for sobriety. There are several accounts of pirate ships easily being boarded because the ship was too drunk to fight One of the best known examples was the capture of Anne Bonney, Mary Reed, and Calico Jack Rackham. Even Bartholomew Roberts, the tea totaling pirate was unable to stop his crew from drinking. How many men on the dead man's chest? The words to the the shanty?